Select number of guests 12345678910111213141516 ? A Mediterranean island with an almost tropical feel, Sardinia boasts seemingly endless pink and white beaches, lapped by translucent waters that are amongst the clearest in the Med. Not surprisingly, Sardinia is a haven for sun worshippers as well as watersports enthusiasts. 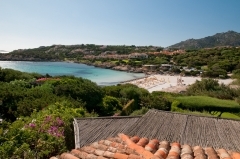 Yet the sheer beauty of the Sardinian landscape also makes the island a nature lover’s delight.